The Sravasti Abbey resident community is not just composed of human beings. Innumerable other residents that never venture inside the Abbey’s halls dwell within the 297 acres of wetlands, forests, and meadows. They live above ground, underground, and under the water. Maybe it’s due to our efforts to create peace in a chaotic world and cultivate compassion in our hearts. Whatever the reason, there seems to be increasing diversity in the animal residents that find their way to this safe home of the Three Jewels. In the past few weeks, we sighted our newest residents. Puzzled as to why the bird feeders were being emptied each night, I went out with a flashlight one night to investigate. I was surprised to find a little Northern Flying Squirrel enjoying the seeds in the feeder. A few nights later, we discovered another one. We want to make this pair feel at home, so began research to learn how to insure a safe and appropriate habitat for our new residents. We’ve learned a lot about them. Northern Flying Squirrels are not rare in Washington State, but they’re rarely seen, partly because they are nocturnal and because they usually live in forests and woodlands. We don’t know what drew them to the developed area of the property near the Abbey residences. Maybe it’s the large and very old spruce trees dotted around. They particularly like spruce trees because they support one of the fungi the squirrels eat. 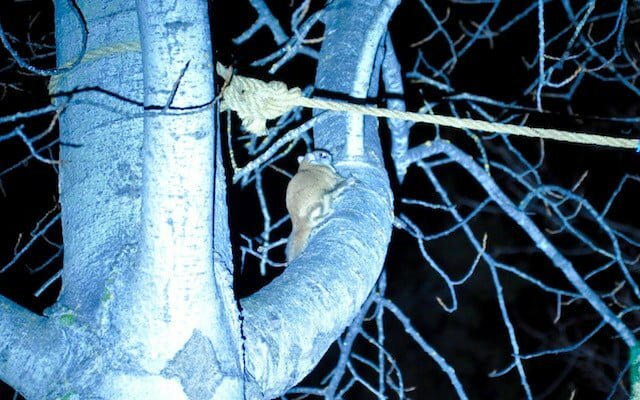 Flying squirrels make their homes in snags, woodpecker holes, and abandoned nests of birds and other squirrels. They will use nest boxes too, so we plan to construct a nice house built to their specifications. Sometimes multiple squirrels will nest together to keep warm in the winter. They eat fungi, lichen, cones, berries, and buds. As we learned from experience, they also like birdseed! 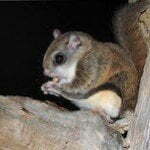 Flying squirrels especially seek out the mycorrhizal fungus, a fungus that helps tree roots absorb water and minerals. The squirrels ingest the fungi, and then the undigested matter is spread throughout the forest helping the trees with this absorption process. It is said that many trees cannot survive without this mycorrhizal fungus. Our new residents are clearly doing their fair share of offering service! 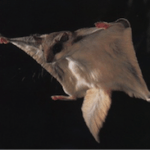 Flying squirrels have been around for a long time. Fossils indicate they have been here for at least 18,000 years. This particular species of flying squirrel is not endangered but hard to count because they rarely come out during the day. These little squirrels reminds us of the interdependence between forest health and the beings that live there. They also reminds us that the old big trees and snags are homes to many creatures we may never see. Our community will continue our efforts to keep the Abbey forest healthy for the sake of these creatures, future generations, and our whole planet. Forest work will begin soon. You’re welcome to come and help! See the Visit section.